While ago, I posted my traumatic experience of breastfeeding. Thinking back, I couldn’t wait to get away from the feeling of guilt for feeding my baby girl the bottles all the time, which was exacerbated by the pro-breastfeeding trend in recent years. All I wanted back then was to start giving her solid food as soon as possible so that at least I can feel I am giving something natural, as opposed to something artificial (very biased I know). As such, I was always picturing about introducing her solid food after she would turn six months, a common benchmark in Japan. I was thinking about moving forward slowly and carefully to see what food our baby could take or not take, as many of the first timer parents would do. I thought of starting off with rice porridge, which is the very first food to start feeding your baby in Japan. It is culturally taken for granted, and if you say otherwise people may get confused. We just don’t know that other options exist. If you ask any Japanese person, I bet almost 99.9% of us would say the same. Historically speaking, rice has played imperative roles over the years in this country, not only as our staple food but also as alcohol (sake), condiments (mirin, vinegar, etc. ), glue (used for dyeing), fertilizer…. there is even this old women’s tale that they would give the watery part of rice porridge to newborn babies if their mothers could not produce enough breast milk. It’s almost like you cannot talk about Japan without understanding the importance of this incredible grain, because rice is our norm and the base of what we are. This was how it started, our first baby food experience. 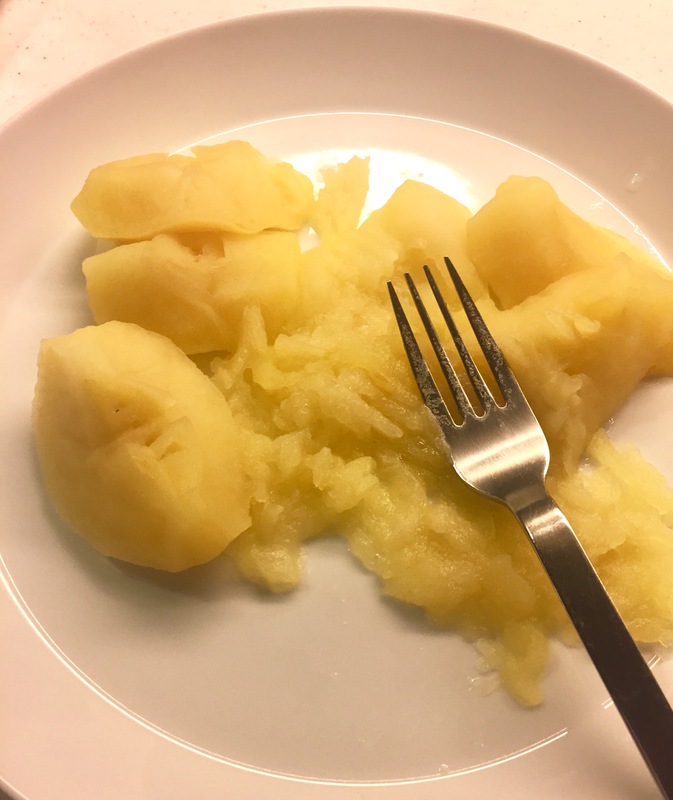 According to M, the guru, the best first food is mashed steamed apple, i.e. apple mousse. That’s right, apple, it’s a fruit, not at all rice… Another panic went through my head, but I shook my anxiety off and tried my best to be my normal self. In the kitchen M took out a beautiful red apple and put it in a small boiling steamer, and carefully mashed it when it was done. I still remember this shiny, juicy, almost golden honey like mashed apple M prepared. And she suggested me to give a small spoonful to our baby girl who was curiously sitting in the lilac Bumbo chair on top of the huge kitchen island. It was going to be her very first bite. I thought, from this moment on, her poo would be different forever. She took it, moving her mouth as if she’s really tasting it, and when I offered the second spoonful, she took another, and then another, and then the small portion M had put on a small plate was all gone. Our baby absolutely loved it. More than three years have past since then, and a couple of weeks ago our now 4 year old was a bit sick with some minor tummy bug. She didn’t have any appetite but would only eat one thing…. and it was apple mousse. Usually in Japan we give rice porridge to those who are ill, which is very common and is followed everywhere including hospitals. But our girl would not eat rice porridge. Every time I made an attempt to feed her rice porridge during her illness, hoping to give her some energy back, she just made faces and spit it out. She just would not eat anything but apple mousse. This puzzled me a lot, because I thought that the rice porridge was the thing to eat when you are ill, and didn’t know there could be any alternative. But through my daughter I finally realised what I took for granted was only true in my home country. When people are ill they actually eat the food they’d feel most comfortable with or familiar with, and this, I now believe, depends on what you used to eat in your early childhood. In my daughter’s case it’s apple mousse, the very first food she ever tasted in her whole life. It is certainly something I did not foresee prior to starting the solids with my girl, and it surely shook my mindset and made me understand about different perspectives in one of the most basic human behaviors.